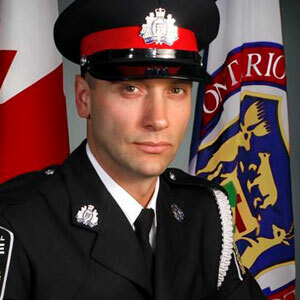 A 2 year veteran of the Peel Police Department, Cst. Artem “James” Otchakovski was patrolling the streets of Brampton late Monday night when he received a call just after 11:00 p.m. to assist another officer. Moments later, the 36-year-old officer from Barrie was involved in a deadly car crash. Otchakovski clung to life for nearly 24 hours, but was pronounced dead at Toronto’s Sunnybrook hospital on Tuesday about 9:00 p.m. His devastated wife, Erin, and several colleagues were at his side. No details have been released of what caused the horrific two-car crash and whether speed played a role. The force’s major collision bureau is continuing its investigation, which may take weeks. Otchakovski was driving a marked cruiser when his vehicle and another collided at the intersection of Airport Rd. and Steeles Ave. E.
The cruiser wound up wrapped around a light pole. The impact left the car in such a condition that investigators have had trouble retrieving a computer module that could help them tell how fast it was going before the crash. Our condolences go out to James’ wife, Erin, and their 3-year-old son, Owen.